Create a caption for this cartoon — see below! What’s So Funny About Math? 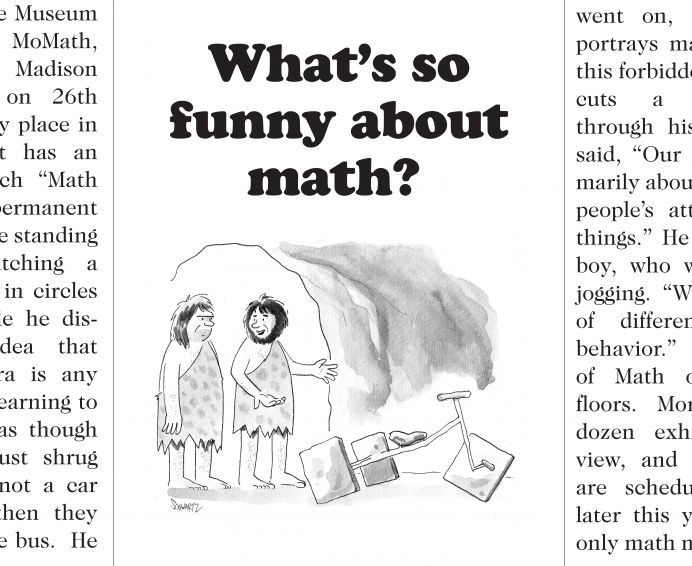 is a temporary exhibition in Composite, the gallery at MoMath, featuring a collection of cartoons related to math and curated by former New Yorker Cartoon Editor and present Cartoon and Humor Editor of Esquire, Bob Mankoff. Each cartoon is paired with commentary from someone interesting who works in a math-related field. Cartoonists featured in the show include Roz Chast, Drew Dernavich, Dana Fradon, James Stevenson, Robert Leighton, Jack Ziegler, Charlie Hankin, Sidney Harris, Nate Fakes, Dan Reynolds, Mike Seddon, Pat Byrnes, Mark Heath, Nick Kim, and of course, the inimitable Bob Mankoff himself. The cartoon above, based on the unique Square-Wheeled Tricycle exhibit in the Museum, is missing its caption. MoMath wants to hear from YOU: create your own fun, witty, and clever caption for a chance to win a prize! Visit the show and submit your entry onsite for a chance to win a gift bag of goodies from Additions, the shop at MoMath! Not in the area? The Museum is still happy to receive your submission; the best captions will be posted online at the end of the show. Email your name, your age if you are under 18, and your caption to funny@momath.org. Please note: By submitting an entry, you represent that the submission is your original work, that it has not been copied from others, nor does it violate the rights of any other person or entity. You agree that all submissions become the property of MoMath, and that your entry constitutes irrevocable, perpetual permission for MoMath and its authorized agents, without compensation to you, to use, reproduce, print, publish, transmit, communicate to the public, distribute, sell, perform, adapt, enhance, edit or display your entry, and your name and city and/or state for all purposes, in any and all media now in existence or hereinafter created, throughout the world.